Mexico City has always been a seat of empire. In its grandiose pretentions and sheer swagger, it gives the impression of power exercised over great distances. And yet this power has frequently been contested, lending the city a tough, battle-hardened look. At the same time, life in the Mexican capital can be carefree and intoxicating, and it continues to offer any visitor not only glimpses of past grandeur, but a fascinating wealth of the culture of Mexico today. 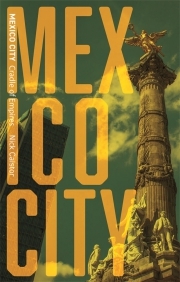 This book explores how the city has grown over the centuries from the Tenochtitlan city-state, to the capital of the Spanish empire’s ‘New Spain’, to French intervention, revolution, to the newly branded CDMX. Nick Caistor leads us through centuries of history and into the material city of today: from recently constructed museums and shopping malls, to neighbourhoods where centuries-old traditions still appear to be the norm. Whether sampling ice cream at Xochimilco, watching freestyle wrestling at the Arena Mexico, or savouring long Mexican breakfasts, Nick Caistor reveals why the city continues to fascinate. Nick Caistor is a former BBC Latin American analyst, and Latin American editor of Index on Censorship magazine. He broadcasts regularly on Latin American literature and art. He is the author of Mexico City: A Cultural and Literary Companion (1999) and Octavio Paz (Reaktion, 2007). He is editor of two anthologies and has translated many novels by Latin American and Spanish authors.